Last year during my 2015 Travels I went many places where there was no cell coverage and it was difficult to blog, text, email, web surf, etc. I was not be able to do these things many parts of days and at nights. I would need to stop for long periods of the day when I had coverage. I have AT&T as a carrier. In Quartzsite at the RTR this year there were so many people in the area that they taxed the cell phone system. Even with 3 & 4 bars of 4G service, in the evening there were times when I could only text and one night only talk. I would often get a message that says can't activate cellular network or can not access data. One day I monitored the network as I drove to town workin on the college course I am teaching. The closer I got to the cell tower the better response I got. I connected my Wilson cell amplifier that I bought before my trip and I was able to move from 4G to LTE service thus increasing my throughput, although in the evening it was slower. 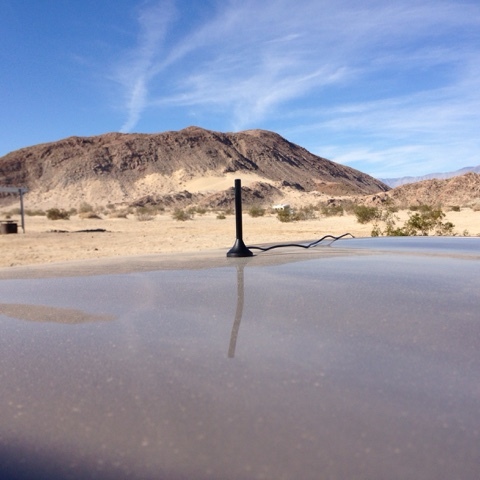 After the RTR I spent 3 days at Slab City where the signal was inconsistent without the amplifier getting 3-4 bars of 4G. 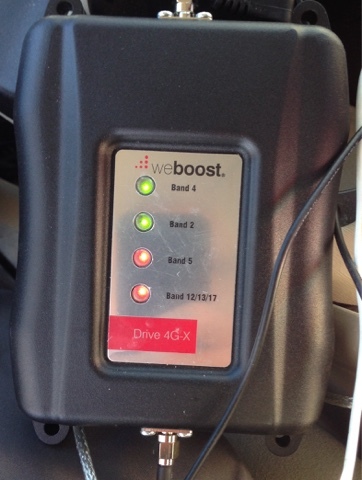 Using the cell amplifier I again started to get 4 bars LTE service although service wasn't always consistent. This is the 3 inch antenna that came with the amplifier. With a bit of research I found that this small antenna is best for data, where the 12 inch center-loaded are just a little better tuned for voice. I had an older model Wileon Amplifer that didn't cover all the frequencies this one does. With two lights green and two red I am getting 2-3 bars of LTE without the amplifier and 5 bars of LTE here in the desert of southern California. A one day test before I left home in MA I drove through southern New Hampshire and Vermont and kept a signal where I have dropped calls in the past. Blogging as much as I do and uploading pictures it's great to have the better coverage. The only drawback is the approx $450 cost, but since I work in the road it is a great help.